Bill Thomas is a Board member and the owner of the building next door to the library. He previously got the library to rent the building from him, at this meeting the Board agreed to buy the building. Anybody see a conflict of interest? Appearance of a conflict? Thus, a municipal legislator’s failure to vote either “yea” or “nay” on a proposed ordinance must be interpreted to have the same effect as either a “yea” or a “nay” vote. 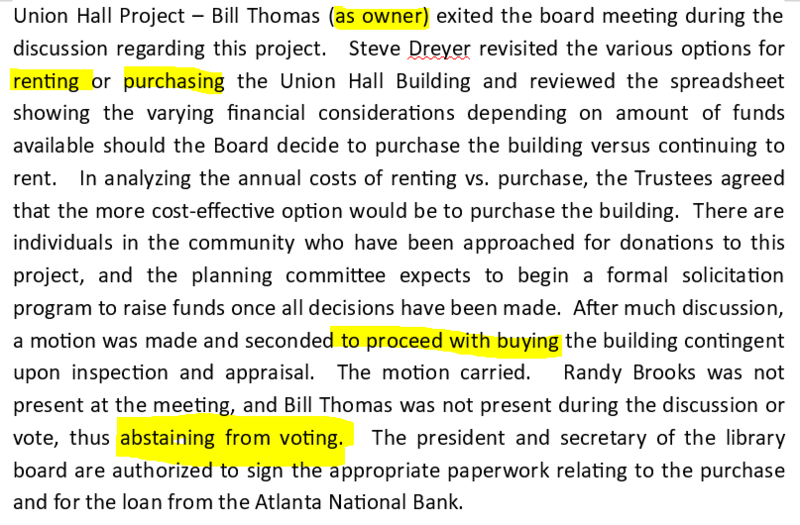 That means Bill Thomas approved taxpayers leasing his building and at this meeting he agreed to not only sell his building, he agreed citizens needed to buy it. A municipal officer shall not be financially interested directly in the officer’s own name or indirectly in the name of any other person, association, trust, or corporation in any contract, work, or business of the municipality, or in the sale of any article whenever the expense, price, or consideration of the contract, work, business, or sale is paid either from the treasury or by an assessment levied by statute or ordinance. The Library Board is meeting tonight at 6:30. Citizens of Atlanta should be asking questions. The State’s Attorney for Logan County should be answering them. If found guilty, it’s a felony! Actually, two felonies: lease and purchase. Posted in Local, Progressives, Taxes.Tagged Atlanta Il, Bill Thomas, Logan County, Logan County State's Attorney, Prosser Rule, Public Library, Public Officer Prohibited Activities Act. If you would have taken the time to meet Bill Thomas, you would see how ridiculous your story of this man is. We should all be so lucky. Very funny! Thanks for playing. (a) No person holding any office, either by election or appointment under the laws or Constitution of this State, may be in any manner financially interested directly in his own name or indirectly in the name of any other person, association, trust, or corporation, in any contract or the performance of any work in the making or letting of which such officer may be called upon to act or vote. Silly us. Laws only apply to the serfs. Those who hold public office don’t have to trouble themselves with such things. So, you think elected officials can buy, sell, and lease anything they can talk the board they are serving on into? No, I’m pretty sure that was no where in my comment. What I’m saying is you’re providing misleading information. Oh, and by the way.. the States Attorney PROSECUTES crimes, if the library board was suspected of wrongdoings he should not be acting as a defense attorney. Who said defense? The citizens should be asking why he isn’t calling for an investigation! You said the citizens [at the meeting] should be asking questions and the Logan County States Attorney should be answering them. Which seems like you’re implying that the Logan County SA should be responding to the concerns of the citizens on behalf of the library at the expense of all of the tax payers in Logan County. You typed it. Do you not want to address all of the other misinformation you provided? No – I don’t have time to research a story I did weeks ago. It was researched when I wrote it, I’m not wasting time now. Seriously, I hope you learn how to read. Are you related to Bill? Is this you Bill? No this is not Bill. Wow, no integrity, and you’ve graduated to personal insults, classy. A simple check of the definition for municipality would have revealed that you were wrong. I just asked nicely for you to just look up the definition to leave you with dignity to correct yourself, print a retraction or take the whole thing down, but instead you go off on a tangent about something that was not in my post at all. Stop being so defensive and proud, it’s ok to make mistakes and nothing wrong with accepting those mistakes gracefully. Maybe you should have commented a month ago. I’ve got a thousand things to do outside – if you want your own blog site, start one. I don’t have time for month old stories. Well sorry to waste your time on a month old story that was getting passed around today and causing hysteria. You obviously don’t live here and don’t care that some residents were wanting to go in with YOUR information just to get embarrassed out of the building. I thought journalists had a responsibility to their readers, I guess not. Enjoy your day. He still can’t recuse himself and think that’s good enough. The result is still the same. I will add a document to the story you can use at the meeting tonight, sorry – too many things going on today. I got out of line. Josh, stop your incompetent posts. I am an Atlanta taxpayer. You are a police officer that I provide a salary to. For you information all elected official regardless of their body of government complete an Economic Interest Statement which they agree to comply with the law Diane posted. Not to mention., they take an oath of office to perform a fiduciary responsibility. I have seen Bill’s Economic Interest Statement and it certainly begs a few questions to be answered. So, breaking the law is okay? Next Post Begging for more taxes!